If you're like most people, the most you'll get for your birthday is the average 6.6 greeting cards. 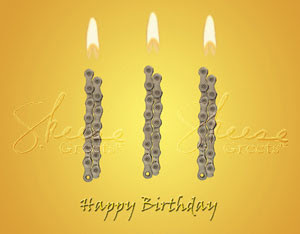 Even if it's a cool bicycle themed card like this, it won't come close to matching the late Malcolm Forbes 70th birthday bash. For what would be his final birthday celebration, this multimillionaire publisher threw a birthday party for the ages. Held at the Palais Mendoub (which he had acquired from the Moroccan government in 1970) in the northwestern city of Tangier, Morocco, Forbes spent an estimated $2.5 million for the celebration. He chartered a Boeing 747, a DC-8 and a Concord to fly in eight hundred of the world's rich and famous including his friend Elizabeth Taylor, Barbara Walters, Henry Kissinger, half a dozen US state governors, the CEOs of scores of multinational corporations likely to advertise in his magazine. The party entertainment included 600 drummers, acrobats and dancers and a fantasia - a cavalry charge which ends with the firing of muskets into the air - by 300 Berber horsemen. Today, August 19 would have been Malcolm Forbes' 89th birthday. I wonder what kind of party he would have thrown for himself.